This is the title of a famous book that was a result of multi-year studies and research done by Dr Stanley and Dr Danko to discover the profile, lifestyle and habits of America’s wealthy households and how they became wealthy. The title is intriguing as they say, because initially they started their research by surveying people in upscale neighborhoods across the United States, and in time, discovered something odd. That many people who live in expensive homes and drive luxury cars do not actually have a lot of wealth. And then they discovered something even odder: many people who have a lot of wealth do not even live in upscale neighborhoods. A lot of people with high incomes who live there actually have a lot less wealth than they should. And a lot of people who are really wealthy – do not look like they are, hence the name – the Millionaire Next Door. The definition of wealthy for the purpose of this research is important to understand. Obviously one criteria is the actual net worth number. The nominal cutoff was households with a minimum wealth of 1 million USD. But their intention was to research not the mega rich, so they dropped the ones with households of wealth greater than 10 million USD. 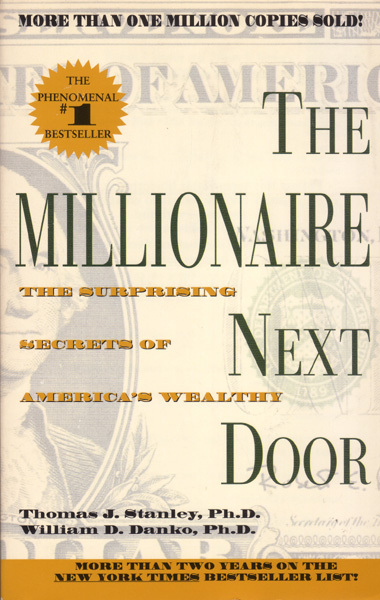 About 95% of millionaire households in the United States had a net worth between 1 and 10 Million USD (in the mid 1990’s when this was published), and that was the focus of this survey. This is typically the level of wealth that, in their view, could be attained by many working class regular Americans at that time. I am sure something like this can be extrapolated to other countries too like India, with the nominal figures a bit different, but broadly similar distribution statistics between the “mega-rich” and the “ordinarily wealthy”, and perhaps, a similar set of findings. Another way “being wealthy” was defined is one’s expected level of net worth, in comparison to one’s age and income. Multiple your age times your pretax household income from all sources except inheritance. Divide that by ten. This, less any inherited wealth, is what your net worth should be. To be comfortably well positioned as a prodigious accumulator of wealth, you should have twice the level of wealth expected. So taking both the nominal (absolute) and relative definitions of wealth, this survey was done almost over a period of a decade from the late 80’s to the early 90’s. In summary, 80% of the millionaire households are ordinary people who have accumulated their wealth over one generation. There is a set of patterns related to their lifestyle and habits that are conducive to wealth building. As they say, while there are a hundred paths to Nirvana, but if one adopts some of these, it is more likely than not, that one will find oneself being a Millionaire Next door – not in a hurry, but slowly and surely!